The site was previously occupied by a former engineering factory and is situated on the edge of Stourbridge Town Centre. The site is bounded by residential properties on the south and by the Stourbridge Canal to the north. The River Stour runs through the site. The site closed in the mid 1980’s – the buildings have been demolished and the site has been cleared awaiting redevelopment. Significant pockets of Japanese Knotweed [Knotweed] were identified on-site and along the banks of the River Stour. It is believed that the infestation has occurred as a consequence of Knotweed rhizomes being washed down the River Stour onto the site and becoming established in the banks over a number of years (and then spreading across the site). 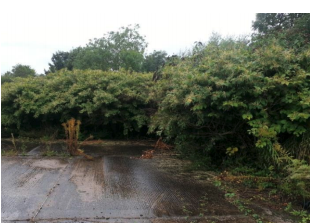 Envirotreat were commissioned by the client to produce a Knotweed Management Plan (KMP) for the site. The KMP described the preferred methodology for the control / eradication of the Knotweed in accordance with the Environment Agency Code of Practice and the requirements of the client (timing and budget). The cutting of the Knotweed plants (canes) and the excavation of the rhizomes was not considered to be an option for this site – there was a significant risk of rhizomes being spread across the site and it was considered impracticable to excavate the rhizomes on the river bank. Burial on-site was also discounted due to uncertainties with the proposed site development – the presence of buried rhizomes would have potentially restricted the development of the site in the burial locations. Off-site disposal was also discounted due to prohibitive costs and the additional risks associated with the excavation, loading and transport of the material (potentially spreading rhizomes across the site). It was therefore decided that treatment with herbicide would be the preferred approach.